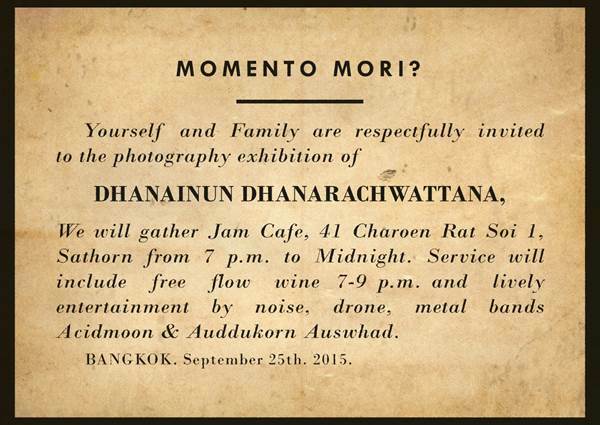 Dhanainun photos examines the frailty of all life and absurdity of human rituals. A dagger to the heart, a poison to the nerve, a slash across the vein: all manners of violence bring about the same end. A stamping into the ground, a crushing under the wheels, a fatal bite to the spine: the end of the line comes alike to all living things. But death only matters in some specific contexts, and is only of worth when applied to the sentimentality of the livings. The great equalizer falls short in equalizing its significance across the many domains of life. Momento Mori? suggests simple lines of arguments: that it matters only when framed in a context permitting human values, and that without it, all that remains are but questions without question mark. A Bangkok-based sometimes photographer, writer and curator whose main interest lies in experiencing the world through words and pictures. Self-taught from the scratch by a lot of books and Internet articles, Dhanainun does however have a BA degree in Geography and currently works in the alternative energy industry. New 4 piece experimental, noise, drone from Bangkok. Black metal, noise, drone, free improvisation 3 piece from Bangkok formed in 2013.